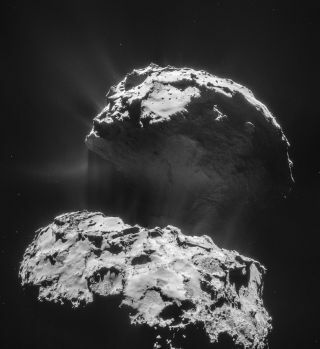 This image taken by the Rosetta spacecraft shows Comet 67P/Churyumov-Gerasimenko flying through deep space. The probe will make a close flyby of the comet on Feb. 14, 2015. A European spacecraft orbiting a comet continues to beam incredible photos of the icy, dusty cosmic body back to Earth. The new comet photos from the Rosetta spacecraft, a European Space Agency probe, show Comet 67P/ Churyumov-Gerasimenko in an incredible new light. The comet is beginning to spout more jets as it makes its way toward the sun for its closest approach in August. Rosetta was about 17 miles (28 kilometers) from the center of Comet 67P/C-G when it took the amazing photos, and now, the spacecraft is about to embarking on a different kind of orbit that will bring it even closer to the comet's surface. "On 4 February, Rosetta moved into a new operating phase characterised by a series of flybys past 67P/C-G at a range of distances, the first of which will be the very close encounter planned for next weekend, when Rosetta will pass just 6 km from the surface of the comet on 14 February," ESA officials said in a blog post. This Rosetta photo shows a jet sprouting from Comet 67P/Churyumov-Gerasimenko's neck on Jan. 31, 2015. The specks surrounding the comet are "noise" in the image including bits of dust and debris sloughed off by Comet 67P/C-G while it flies through space, ESA officials said. Rosetta arrived at Comet 67P/C-G in August 2014 and will travel with the comet through its path around the sun through its closest approach with the star later this year. The orbiter should continue studying the comet at least through the end of 2015, ESA officials added. In November, Rosetta dropped its Philae lander onto the surface of the comet, marking the first time humans have ever soft-landed a probe on a comet's surface. Philae made a bouncy landing, eventually coming to a rest near a cliff in a shadowy part of the comet. Officials still aren't sure where Philae is, but they hope it wakes up as the comet makes its way around the sun, heating and potentially providing more light for Philae in the process. Rosetta will also hunt for Philae through the course of its normal science operations during the comet flyby Saturday. Comet 67P/Churyumov-Gerasimenko's amazing jets can be seen from a distance in this image taken by the Rosetta spacecraft on Feb. 6, 2015. "Rosetta's busy science schedule is planned several months in advance, so a dedicated Philae search campaign was not built into the plan for the close flyby," Rosetta project scientist Matt Taylor said in a statement on Jan. 31. "We'll be focusing on "co-riding" observations from now on, that is, we won't be changing the trajectory of Rosetta to specifically fly over the predicted landing zone in a dedicated search, but we can modify the spacecraft pointing and/or command images to be taken of the region if we're flying close to the region and the science operations timeline allows."